Three is a Melbourne-based trio of the unusual instrumental combination of trumpet, trombone and guitar. As you might imagine, there's not a lot of extant repertoire for this intriguing combo, so Three has commissioned four Melbourne composers to write new works, and also included their version of Jane Hammond's arrangement of Percy Grainger's Random Round. Hailed as "an ensemble that plays with great musicality" (Alan Holley, classikON.com) Three seeks to establish new, cutting-edge chamber music with a special focus on presenting performances that resonate with current-day audiences. Founded by three musicians unified in a goal to diversify and expand the chamber music repertoire for their instruments, each member brings a distinctive musical background to the group, with influences including world music, jazz, popular music, traditional “classical” music, and avant-garde contemporary music. The ensemble’s debut album, Midnight Songs, pays homage to the group's roots in Melbourne. Four new works by Melbourne-based composers are paired with the trailblazing aleatoric work Random Round, written over one hundred years ago by the city’s most renowned historical composer, Percy Grainger. The combinations of sounds and textures will surprise and delight. This CD presents new works commissioned for Three, a Melbourne-based ensemble comprising Joel Brennan (trumpet) Don Immel (trombone), and Ken Murray (guitar), all of whom are staff of the Melbourne Conservatorium of Music, Melbourne University. The ensemble has a self-described goal of “seeking to establish new, cutting-edge chamber music with a special focus on presenting performances that resonate with current-day audiences” (booklet, p.5). They have done this through a series of commissions of new works, many of which are presented for the first time together on this CD. The music performed by Three can claim originality on two fronts. On the one hand, their commissions present a common ethos of accessibility, with new and contemporary works that are tonally accessible, and sufficiently uncluttered to enable broad appreciation. On the other hand, the particular combination of trumpet, trombone and guitar is an unusual grouping that nevertheless has incredibly rich tonal and timbral possibilities. Throughout the recording, the artists demonstrate a clear willingness to listen and respond to each other’s sound worlds, and switch seamlessly between soloistic and accompaniment passages in the works they’ve commissioned. The trombone and guitar share a wide tenor range that is enriched by their different sonorities. Meanwhile, the trumpet extends the trombone’s sonority into a higher range, adding necessary brightness. A really pleasing aspect of the recording, evident immediately and still present after numerous listenings, is the effectiveness with which the musicians blend with each other. The musicianship and artistic vision of the ensemble make a compelling case for more repertoire utilising the combination of trumpet, trombone and guitar. The CD itself comprises commissions, as previously stated, alongside an original work by Ken Murray and a new rendition of Percy Grainger’s Random Round(1912-14). The first two tracks, Andrew Batterham’s Organica and Christian O’Brien’s PIT_T (pronounced ‘Pity’), both 2013, share filmic sensibilities and a contemporary chordal language well suited to the tessitura and tonal combination of the instruments. While intricately written, these two pieces are versatile, and would pass muster in various commercial contexts. Organica, in particular, offers a slowly-developing (or ‘organic’) unfolding of the initial tonal material, with individual lines that seem well suited to the personal tastes of the performers. One gets the impression that they particularly enjoyed their contributions to the recording of this piece, and it works well as an opener for the CD. The third piece, Katy Abbot’s Midnight Songs (2013), provides the album title as well as the most substantial compositional material for the project, with four movements at over 26 minutes in length. This work makes effective use of the guitar’s capacity to provide both melodic and harmonic textures, while sensibly lending rich melodic responsibilities to the two brass instruments, whose lines emerge and occasionally intertwine throughout. The performance is sensitive and sparse, with the performers doing a really good job of staying out of each other’s way while passing the melodic focus around the ensemble. The version of Grainger’s Random Round presented here follows a transcription provided by Jane Hammond, drawing on the resources of the Grainger Museum at the University of Melbourne. Murray gets a nice, heavy buzz going on the opening guitar chords, before slipping neatly beneath lightly lilting trombone and trumpet lines. The guitar never completely disappears, however, rising and falling in intensity to articulate moments of heightened harmonic tension that appear and disappear as the round progresses. Notwithstanding some very delicate melody lines, there is scope here for the brass to match the guitar with some edgier playing, and take a few more risks. Finally, Murray’s Torque (2013) rounds out the album with a Brazilian popular music-inspired offering that is rhythmically contrasted with the other works on the album, providing syncopated, angular lines across the ensemble. While not ‘bossa’ as a jazz guitarist would play it, the work has clear leanings in this direction, while also offering opportunities for the brass to break away from the contours of the lullabies and other quiet song melodies that appear in previous tracks. Overall, the album is exceptionally well recorded with excellent balance and honest, uncontrived instrument sounds. Occasionally, the guitar’s long resonances (especially where a delay pedal is in use) are difficult for the brass players to match, but this is a common challenge for brass and strings playing together, and Immel and Brennan do a splendid job of leaning into the sound of the guitar. A great deal of hard work has gone into this album, and yet the players clearly have the capacity to continue developing both the breadth of their repertoire and the creative possibilities of their ensemble, which bodes well for future releases. 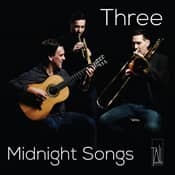 Three is a trio that pulls together the most unique and fascinating instrumentation I’ve come across: trumpet, trombone, and classical guitar. The guitar, for instance, is a soft, delicate, intimate thing. In an ensemble it has to fight – to be heard, that is. Its sound dies. But its attack is momentarily alive. Vivid. Brass, on the other hand, is steady, valorous, bold and boisterous. Or so its reputation goes. But ignore my initial inklings – it works. Midnight Songs is an intriguingly beautiful record. And it’s not only something fresh to our ears; it’s something fresh to our classical music culture. Music intended for us and now. There’s a valuable ethos that drives and binds ensemble Three members Joel Brennan, Don Immel, and Ken Murray. The trio, also Melbourne Conservatorium colleagues, established the project to commission and perform works that resonate with contemporary audiences, while contributing to the their instrument’s chamber repertoire base. Midnight Songs continues Three’s longstanding project with an album that speaks to those who aren’t concerned with the confines of genre. The Australian compositions employ a variety of contemporary harmonic language, electronic soundscapes and minimalist delay, and subject matters that are of our time. It’s never as often as I’d like that I sit down and listen to an album in its entirety. But what a great opportunity to make use of my handmade, hammertone green, floorstanding Moratori speakers. No one ever understands us audiophiles. Regardless, they’re a real sight; and their horn bass design puts the brass in your living room – the neighbours love it. I’m enveloped in a soundstage of unique textures and timbres; and on my first listen, lost. It’s eerie. The sparse textures, rhythmic repetition, digital delay and imitation resemble and evoke the environment of night, and the mood of static introspection that night can induce. Before long, I have no expectation of where these works will lead. Australian composers Andrew Batterham, Christian O’Brien, Katy Abbott, and Ken Murray allow their eclectic listening and performance experiences to penetrate their works. An open mind comes in handy. Opening Midnight Songs, O’Brien’s track PIT_T addresses suicide as the highest killer of men under 44. PIT_T contains three distinct sections that explore physical activity as a means of suicide prevention. The opening minimalist section ends into silence before repetitive contrapuntal lines are introduced over a rhythmic pattern of guitar harmonics. The brief final coda suddenly increases in tempo, driven by a pre-recorded stomp track, before ending abruptly. There’s no sense of assurance. You experience each section as the music commands. Batterman’s Organica functions rhythmically and harmonically as its title suggests: developing from its initial material. It combines classical guitar with delay, an effect imitated in the writing for brass. In Organica, the trio frequently shifts and contrasts stylistic voices: the brass spontaneously enters with be-bop lines that end in sustained growls, while the guitar is at home in idiomatic tremolo, rasgueado, and improvisatory melodic lines. In contrast to the rhythmic intensity and physicality of the opening works, Abbott’s four-movementMidnight Songs explores the unique timbres and textures that emerge through the interaction between these unlikely instruments. The meditative, expansive, and delicately beautiful sounds allow you to appreciate the sensitivity and musicality in the performances of both flugelhorn player Joel Brennan and trombonist Don Immel. The crescendo entries and legato lines of the brass and the naturally instantaneous attack of Ken Murray’s classical guitar are performed with impressive accuracy, creating the effect of an enveloping texture rather than individual roles. Finally, Murray rounds off the album by tipping his hat to Brazilian guitarist Yamandu Costa in his own composition Torque, quoting and appropriating Brazilian rhythmic patterns in an exhilarating and dynamic piece. Ensemble Three is a valuable contributor to – and an inspiring example of – forward-thinking classical music culture in Australia. The ensemble brings together contemporary composers and audiences, and original instrumentation for a sonic experience that is introspective, intriguing, and refreshingly relevant. You should know about it. And you owe it a listen. Midnight Songs by Ensemble Three features an unusual combination of instruments playing four new works by Melbourne composers and the trio’s take on Jane Hammond’s arrangement of Percy Grainger’s Random Round. Trumpeter Joel Brennan, trombonist Don Immel and guitarist Ken Murray are all performance staff members of the Melbourne Conservatorium of Music and they perform new repertoire aimed at current day audiences. The first two tracks, Andrew Batterham’s Organica and Christian O’Brien’s PIT_T, sit comfortably between jazz and classical contemporary, exploiting the bright sound of brass against Murray’s nylon strings with some subtle tonguing effects from Brennan. Katy Abbott’s Midnight Songs fall into four parts. The gentle Lullaby has a mesmeric quality with the guitar weaving over the top of the brass chorus. Midnight Song is slow and spacious, and the pace increases for Variations with some flamenco percussion effects on guitar and some humorous moments before a fade out, while order is restored in the fourth part with a reprise of the lullaby theme featuring Immel’s trombone and Brennan’s trumpet. Murray’s own composition Torque is upbeat and features some lively interplay between the three instruments. All in all this is a delightful album full of little musical surprises.